The sacroiliac joint is a firm, small joint that lies at the junction of the spine and the pelvis. Pain arising from the sacroiliac joint is a common cause of low back pain. Pain is often localized to one side of the low back but can be on both sides as well. 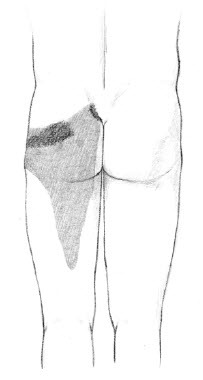 Pain can also radiate to the groin, posterior thigh and on occasion below the knee. The pain can range from an ache to sharp pain. Difficulty turning over in bed, struggling to put on shoes and socks and stiffness in the lower back when getting up after sitting for long periods is also common. 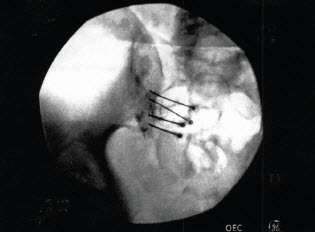 Treatment of Sacroiliac pain often includes antiinflammatory medication and physical therapy. 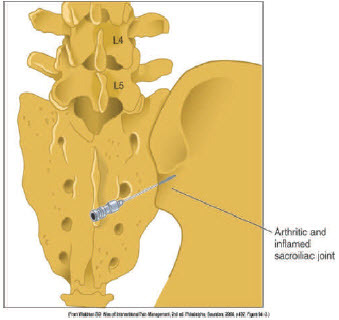 Sacroiliac joint injection can give pain relief as well assistance in diagnosing the source of pain. This injection often conducted with a numbing medicine and cortisone to calm down inflammation in the joint. If significant temporary relief is obtained by injection but long lasting relief cannot be obtained, your doctor may consider radiofrequency treatment. This involves the placement of multiple radiofrequency needles within the joint space or adjacent to the nerves that supply the joint. The goal is to temporarily disable the pain nerves supplying the joint. This typically lasts for several months when effective.